There was success for Rainford’s tennis players at this week’s West Cheshire Open with both Cameron Ashley-Jones and Erin Scott both winning trophies. Cameron won the 12 & Under Boys Singles with a 6-3, 6-1 against second seed Ben Leeman from Cheshire in the final. 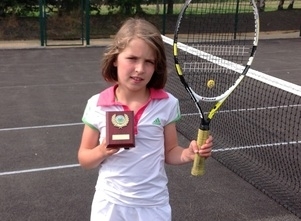 Erin Scott was also a winner in the 9 & Under Girl’s Singles, in the tournament which took place at Upton Tennis Club on the Wirral. Erin won her final against Anna Jones in the final. Maisie Lavelle also reached the final of the 10 & Under Girls Singles whilst Phoebe Mitchell finished third in the 9 & Under Girls Singles.